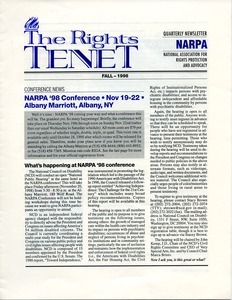 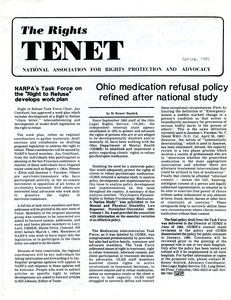 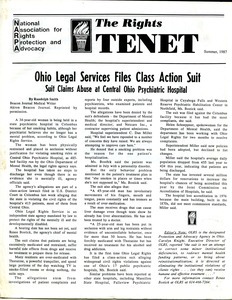 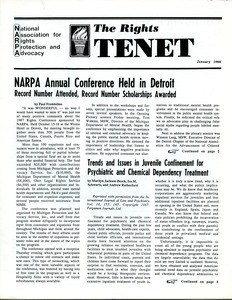 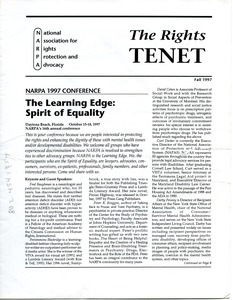 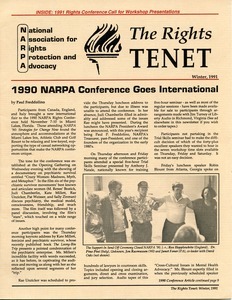 Search results: "the rights tenet"
41 results found for: "the rights tenet"
Bloomington (Minn.) - Includes: "NARPA's task force on the 'right to refuse' develops work plan"; M. Renee Bostick, "Ohio medication refusal policy refined after national study"; "The origins of the right to refuse psychiatric treatment and antipsychotic medication; information on 1985 NARPA conference, "The cause endures." 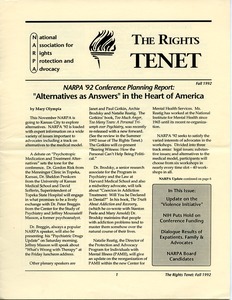 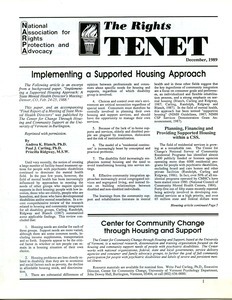 1987 June – 1987 Aug.
Minneapolis (Minn.) - Includes: Randolph Smith, "Ohio Legal Services files class action suit"; "Practical theme for 1987 Rights Conference"; David Ferleger, "Lelsz case spells defeat in Texas"; Mary Olympia, "Landmark Minnesota legislative year"; Rae Unzicker, "Plexiglass cages and broken hearts"; Judi Chamberlin, "Forced treatment is basic problem." 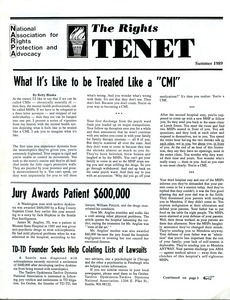 1989 June – 1989 Aug.
Minneapolis (Minn.) - Includes: Betty Blaska, "What it's like to be treated like a 'CMI'"; "Jury awards patient $600,000"; "1989 Rights Conference news"; George Ebert, "Drugs are major part of psychiatric woes says speaker from personal experience"; "Rhode Island consumers open a drop-in center"; Betty Blaska, "Many medications mistakes are reasons for doctors to listen to consumers."